Is TPO commercial roofing right for your business? In your search for the best roofing material for your business building, you have no doubt come across TPO commercial roofing as an option. You are likely trying to determine if it is the best choice for your business’s roof. Chances are you are looking for a roofing material that is durable, energy-efficient, cost-effective, and long lasting. Does TPO roofing meet those requirements? How is it better than similar roofing materials? And, most importantly, is it right for your business’s unique needs? At Montgomery Contractors, we want to help you get the answers to your questions and help you to make an informed choice when it comes to your business’s roof. What Is TPO Commercial Roofing? Thermoplastic Polyolefin (TPO) membranes are a single-ply roofing material. TPO is a relatively new material experts developed as an alternative to EPDM and PVC roofing. It is less expensive and more environmentally friendly. TPO made up of three layers: a polymer base, a polyester-reinforced fabric center, and a top thermoplastic polyolefin layer. The result is a highly flexible, durable material that withstands tears and punctures, as well as dirt, debris, mold, and algae. For those who are looking for green roofing alternatives, TPO is an excellent choice. The roofing material is made from less toxic materials than other roof types and is 100% recyclable. 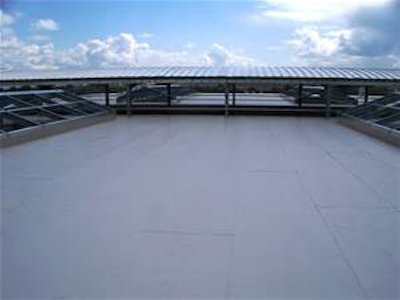 Also, TPO roofing has the ability to reflect UV rays, keeping buildings cooler and reducing the “heat island” effect, which is overall better for the environment. It is more efficient, and can save your business money on energy costs. If you are making an effort to meet LEED requirements, or simply want to make a better, greener choice, TPO presents a better alternative than EPDM or PVC. Is TPO Commercial Roofing a Smart Choice for Your Business? If you are looking for a roofing material that is energy-efficient and eco-friendly as well as low-cost and durable, then TPO roofing provides a solid roofing solution. While TPO is a newer material, it has a high performance record. When properly cared for, a TPO roof can last for 20 or more years. As with any roof, choosing expert manufacturing and installation will ensure optimal results. It’s important to use a professional contractor who has experience with TPO commercial roofing installation. If you are considering TPO commercial roofing for your business building, contact the friendly team of experts at Montgomery Contractors today. We have the skills and experience to ensure your satisfaction. Call us today for a free estimate at (910) 220-2172.